a city in the Peloponnese. 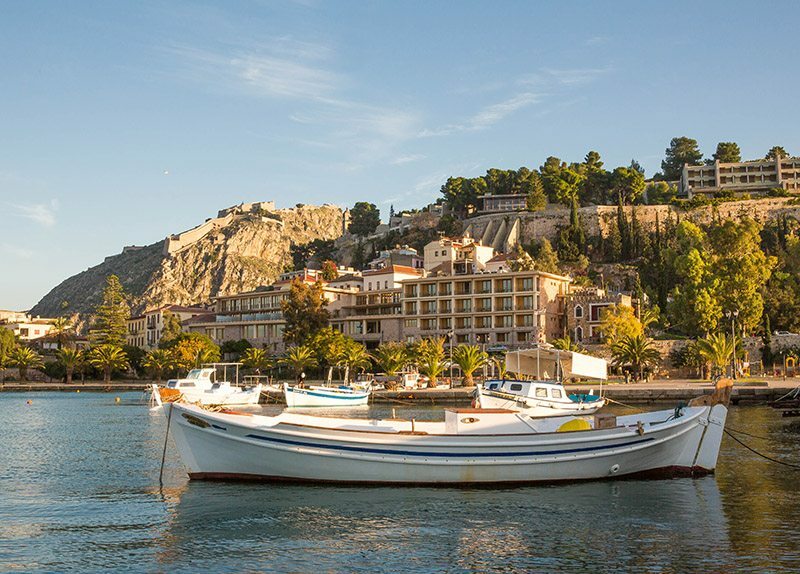 Nafplion's places of interest are too many to mention for a small city but we have tried here to detail some of the things that should not be missed by the Nafplion visitor. Do not miss the opportunity to see the sunset from the Acronafplia Castle, reached by the "Arvanitia Walkway", another fortification that protected Nafplion city. Stop here for a drink at the swimming pool area of the deluxe hotel that is situated here. Nafplion offers countless choices of places to eat at. 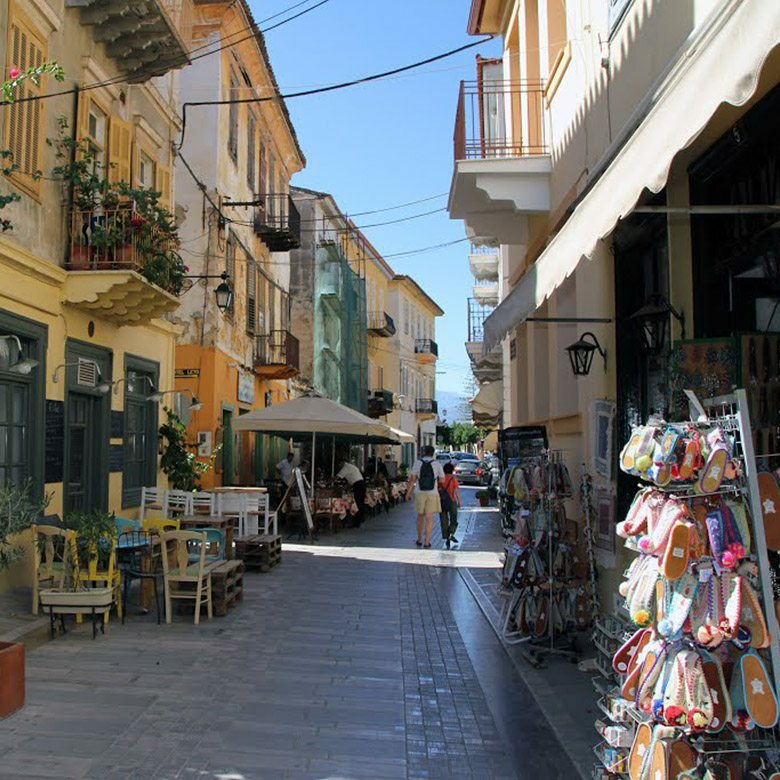 In the small street of Staikopulou you will find many traditional tavernas and traditional sweet shops. If course you prefer to have fish, then head towards the tavernas by the waterfront. 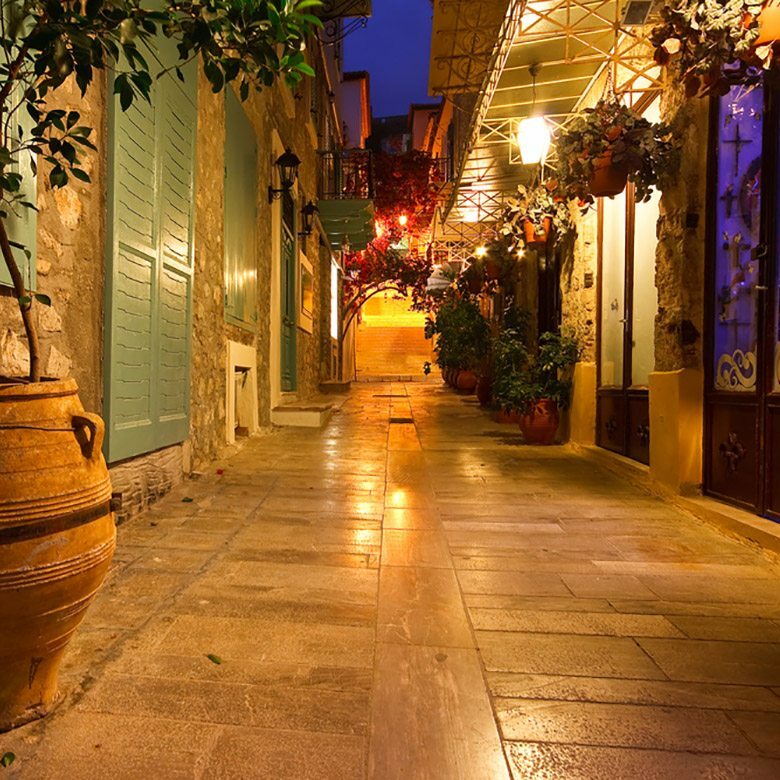 For nightlife there are many small bars dotted in the small streets of Nafplion. Finally if your idea of nightlife is live Greek music and dancing you will find places to cater for your requirements along the road from Nafplio to Nea Kios. 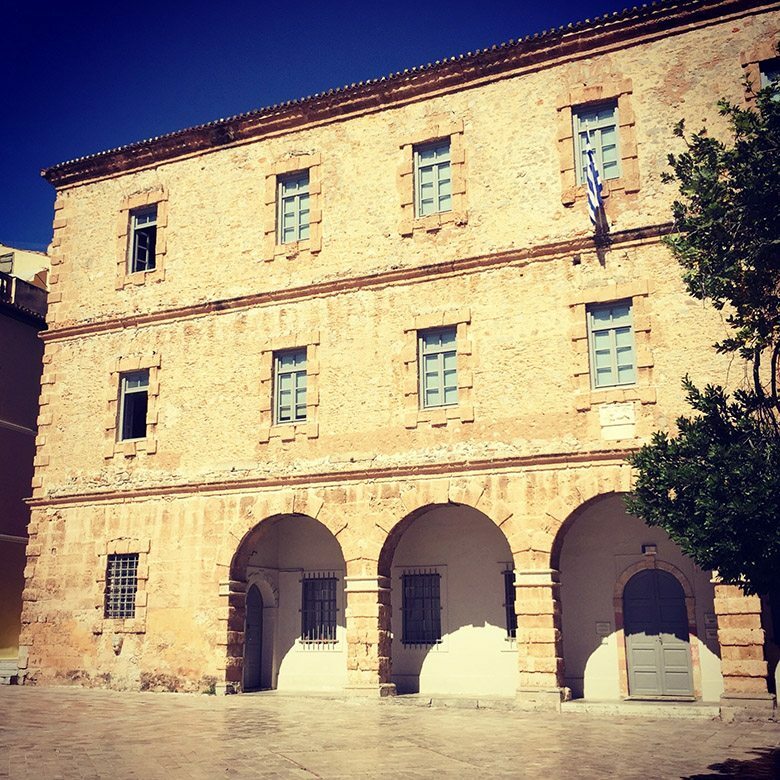 The Archaelogical museum in Constitution Square, the Folk museum in one of the tiny streets by the waterfront, the Historical museum in Amalias Avenue, an Art gallery near the central park of Nafplion, the Toy museum in the old railway station and the Ouzo museum close to the Palamidi. 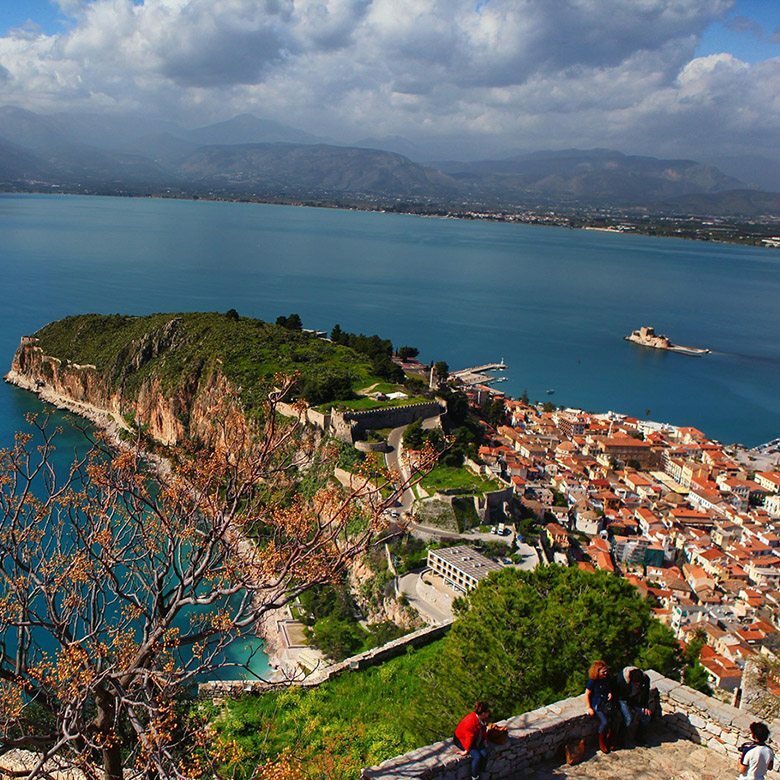 The history of Nafplio, Nafplion, Nafplia, Anapli, Nauplio, Nauplion dates back to Mycenaean times. Finds in the Nafplion region bear witness to the fact that Nafplia was inhabited during the Mycenaean era although the "golden era" of the area was as far back as the Geometric and Archaic eras at which time Nafplia was a founder member of the "state and religion federation" of Kalavria. Towards the end of the 7th Century, Nafplia was destroyed by Argos and the remaining survivors took refuge in Methoni. Later on Argos was to use Nafplio as its port. During the Byzantine era Nafplion becomes the centre of the then statehood. Leon Sgouros was appointed the Lord of Nafplion by the Byzantine Emperor Michael Komninos. Leon Sgouros fought many battles against the Frank leaders Bonifatio Momferatiko and Godefrikos Bilardouino. Eventually he was killed and succeeded by his widow who, in turn, hands over her rights to the Lord of Epirus Michael A. Aggelo Komnino. Nafplion was then plagued by the Franks, Venetians and Ottomans who tried to conquer the city. As a result of this many fortifications were constructed in Nafplion during this period around the first decade of the 15th Century. Due to the fortifications, Mohammed the 2nd gave up trying to conquer the city of Nafplion during the the start of the Venetian - Ottoman war. In 1537 Nafplion experienced its longest siege that lasted 3 and a 1/2 years. The siege came to an end when, with the intervention of France, an agreement is signed that puts an end to the Venetian - Ottoman rule. In 1540 the Venetians handed over Nafplion to the Ottomans. Many Nafpliots followed the Venetians to Venice when they were re-patrioted to their country. The Turks gave special privileges to the Greek Orthodox church during the Turkish occupation that gave Nafplion a leadership role. During this time many Nafpliots returned to Nafplion. Amongst them, many artists writers and literate Nafpliots that had studied in Venice and Rome. As a result, the economic and educational levels bloomed. The Palamidi Castle, on top of the rock of Nafplion, as well as Bourtzi castle build on the small island, have many a story to tell, about lootings that went on and conquerors that tried to to conquer and take advantage of the riches of this small city of the Argosaronic gulf. The many grandiose buildings that still bejewel Nafplion today, tell us even more about the city's history. The Parliament building in the the central Constitution Square, Various parts of the city that remind us of the arrival of Ioannis Kapodistrias, the church of Saint Spyridon outside where Kapodistrias was assassinated and many many more..